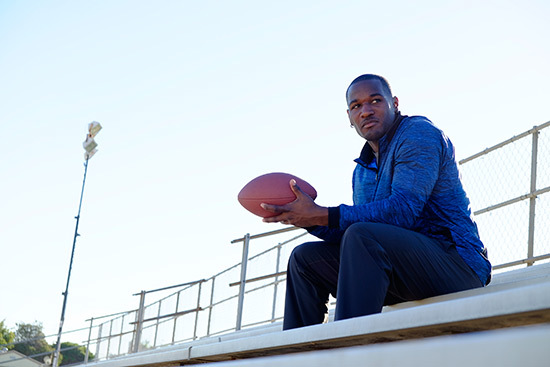 PSA created by deaf Super Bowl Champion and Seattle Seahawks Fullback Derrick Coleman for the “Listen Carefully” youth hearing loss campaign. Today 1 in 6 American teens has permanent hearing loss due to high volume sounds. 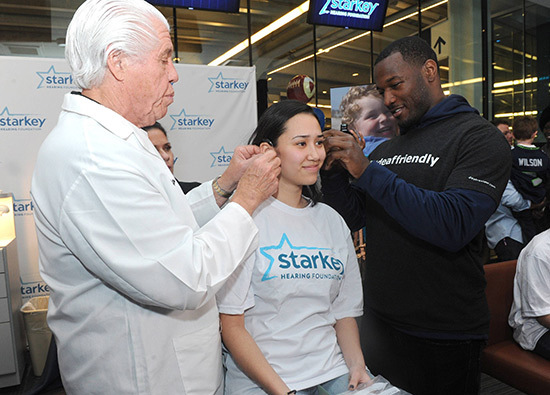 Listen Carefully, a Starkey Hearing Foundation program, has teamed up with newly Grammy Nominated Interscope Recording Artist Aloe Blacc in an effort to raise awareness toward noise-induced hearing loss in teens. The national video contest challenges middle school and high school students (ages 13-18) to create public service announcements about the importance of hearing protection. Blacc will perform a free concert for a student/school who submits the winning PSA on the subject of preventing youth hearing loss. Coleman is helping get the word out about Listen Carefully’s contest, creating a PSA to raise awareness. To raise awareness about noise-induced hearing loss in teens, Listen Carefully, a Starkey Hearing Foundation program, launched a national video contest today challenging middle school and high school students (ages 13-18) to create public service announcements (PSAs) about the importance of hearing protection. The winning student(s) and their school will win a private concert by Interscope recording artist Aloe Blacc in 2015. The “Listen Carefully Contest” was created in response to data showing that noise-induced hearing loss increased 30 percent in teens over the past decade. Today 1 in 6 American teens has permanent hearing loss due to high volume sounds. Listen Carefully is a domestic program of Starkey Hearing Foundation, an international nonprofit that gives the gift of hearing to people in need around the world. “From the studio to the stage, my hearing is a critical part of my art,” said Interscope recording artist Aloe Blacc. “I am so honored to join Listen Carefully to help raise awareness about noise-induced hearing loss and look forward to performing at the school of the video contest winner,” he continued. Football games, concerts, portable listening devices, lawn mowers and even hairdryers can damage kids’ hearing in as little as 10 seconds. “At the core of creating a revolution in hearing health is the conscientiousness that teenagers must develop regarding their own ears,” said Dr. Vanessa Rothholtz, a Board Certified Otolaryngologist in Los Angeles, California. “This begins with education and influences in their environment, such as the music industry, their parents and their friends. However, it is ultimately the young adult’s responsibility to actively participate in the protection of their hearing,” she continued. The Listen Carefully contest is accepting 30-second video submissions between November 24 and December 31, 2014 from teens ages 13-18 who are enrolled an accredited U.S. middle school or high school. Video should be submitted to Listen Carefully’s official contest page (listencarefully.org/video-contest). Qualifying entries will be made public for general voting from January 13-31, 2015. The top three finalists will be notified on February 1, 2015 and the grand prize winner will win a private concert from Aloe Blacc at his or her school. Second and third place winners will each receive a GoPro© camera and a trip to attend the concert with a parent or legal guardian. 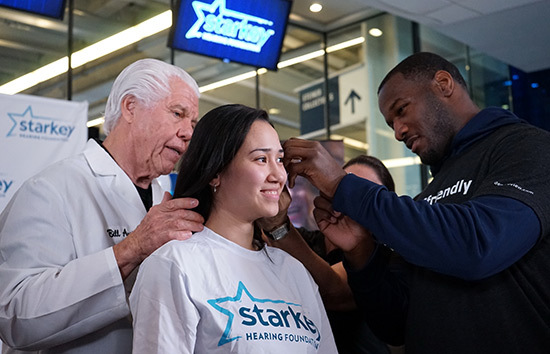 Listen Carefully is Starkey Hearing Foundation’s domestic initiative to raise awareness about noise-induced hearing loss and help prevent a hearing loss epidemic. Today, 1 in 6 American teens has permanent hearing loss due to high-volume sounds. Football games, concerts, music players, and hairdryers can damage kids’ hearing in a matter of seconds. Noise-induced hearing loss is permanent, but preventable. For more information, visit Listen Carefully online at listencarefully.org, via Facebook at Facebook, Twitter, or Instagram. Starkey Hearing Foundation uses hearing as a vehicle to reflect caring and change lives around the world. Disabling hearing loss affects more than 360 million people, including 32 million children, worldwide, yet many do not have access to the hearing devices that can help them. Starkey Hearing Foundation fits and gives more than 100,000 hearing aids annually, and as a member of President Clinton’s Global Initiative, it has pledged to fit one million hearing aids this decade. Last year alone they provided over 175,000 hearing aids for free to men, women and children in need. In addition to giving the gift of hearing through worldwide hearing missions, Starkey Hearing Foundation promotes hearing health awareness and education through the Listen Carefully campaign and provides hearing instruments to low-income Americans through the Hear Now program. For more information on Starkey Hearing Foundation, visit starkeyhearingfoundation.org.